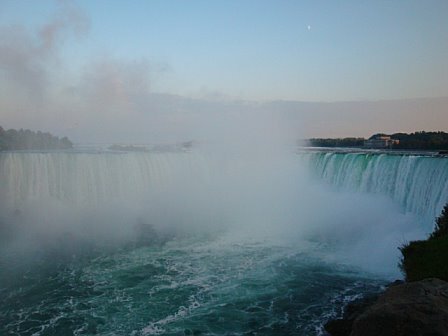 Niagara Falls: One of the world’s most famous natural attractions, is also North America’s #1 Honeymoon Destination! I was here with my family when I was just five year old, but after a recent trip with my husband, I can see why. The falls are quite a sight from far away, or even in pictures. But, the rush you get when you can walk right near them or hop on a boat and ride right up to them is awesome. It truly is an amazing feeling to be with the one you love and hold on to each other as you get thrown around on the boat as it nears the falls. (If you get sea sick easily, you might want to skip the boat ride) It’s also such a sight as you watch the water crash over cliffs that are more than 20 stories high. There are three falls that make up Niagara Falls: The American Falls, The Bridal Veil Falls (how appropriate is that my jet set sweethearts? 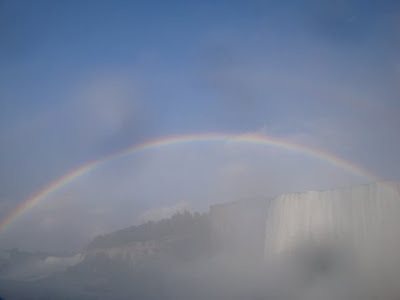 Myth says it’s good luck if a bride dips her toe in the Bridal Veil Falls on her Wedding Day), and finally the Canadian Horseshoe Falls. 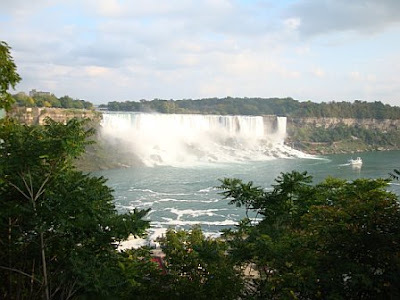 There are many attractions and things to do in and around the falls. 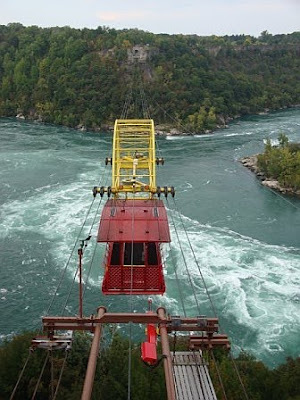 My top suggestion is a ride on the Maid of the Mist. What used to be a border-crossing ferry from the 1800’s is now a tour boat that gets you as close as humanly possible to the falls. 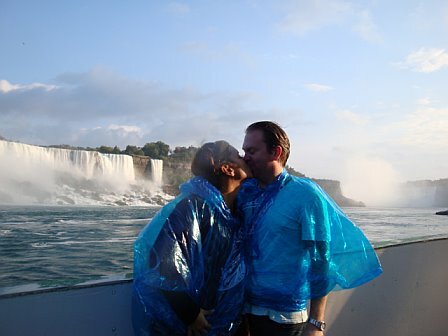 They do provide you with blue rain jackets, but the spray from the falls is so strong that you might end up either a little wet or soaked by the end of the half hour boat ride. Journey Behind the Falls are rock tunnels which have been carved out right behind the falls. Take a walk and find yourself behind a wall of water so thick it blocks out daylight…pretty cool! Just downstream from the falls are the Whirlpool Rapids. 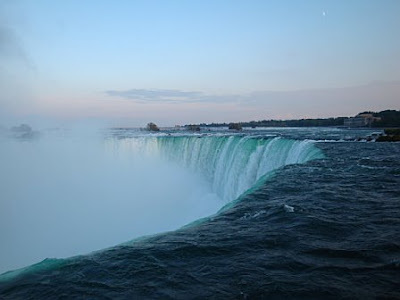 It’s considered one of the most lethal stretches of water in North America. If you are brave enough, you can take a ride in the Whirpool Aero Car (see picture below)- a cable car built in 1913 that takes you for a ride over the rapids as you look straight down onto them…scary! If you need a break from the falls, head to Niagara Parks Botanical Gardens. 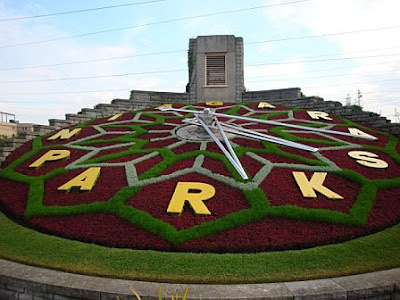 Located just six miles away, you will feel a world away as you get a chance to check out the beautiful flower display with more than 2,ooo varieties. Many people don’t know or don’t think about the Niagara Region as a great destination for wineries…but, in fact, there are many here. We checked out the Pillitteri Estates Winery which has good Riesling and Merlot, but is better known for it’s Canadian Ice Wine- a very sweet and delicious dessert wine or great to pair with salty cheese and crackers. 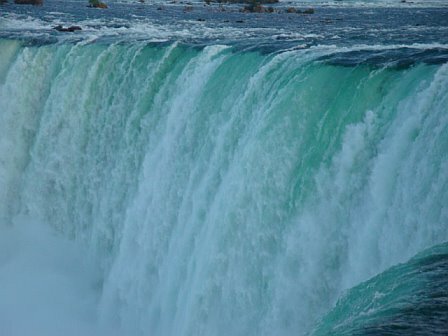 So now that you know a little bit about Niagara Falls as a honeymoon destination, you may be thinking, where should we stay? 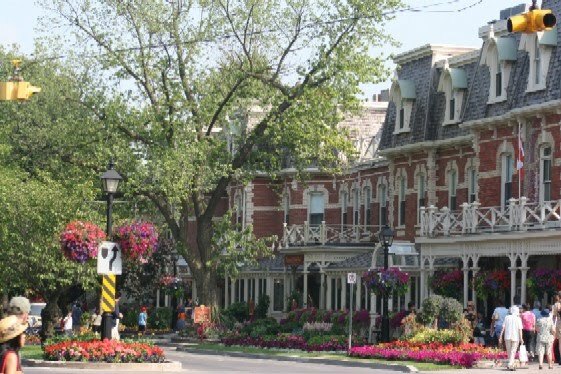 Niagara Falls does have a lot of nice hotels, but I would suggest staying in a town called Niagara-On-The-Lake. This town was built in the 1800’s and is still as charming and historic as it was back then. 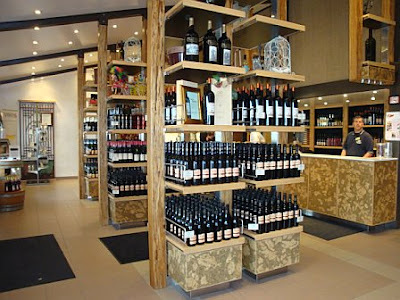 There are great restaurants and shops, and you are close to all of the wineries and of course, Niagara Falls. I have some news to share with all of my Jet Set Smart readers and newly engaged couples…on the 3rd day of each month, you can read a new blog post on honeymoons. 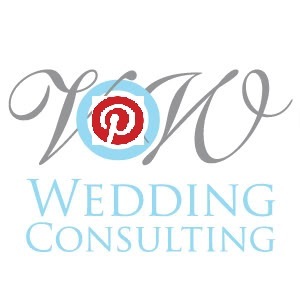 The post will be called Jet Set Smart Sweethearts and will feature a new destination idea for you to jet set to after all of the craziness that usually accompanies planning a wedding. The post can be found at JetSetSmart . On this honeymoon post you will be able to find information on anything ranging from destination suggestions, to hotel ideas, to flight deals, to activities…you name it- and you will find out about it! If there’s anything you would like to read more about in particular, feel free to leave a comment on the bottom of the post with your email so that we can get back to you. Your honeymoon should be your time to jet set somewhere fabulous, exotic, romantic and special with your sweetheart. 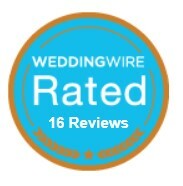 So make JetSetSmart your first destination so we can get you jet setting and celebrating your newly married life! I love to travel….but then again who doesn’t? Part of being a smart traveler is really understanding the times to go, great local finds & those holes in the wall where the locals call home, and your stomach usually calls heaven. So…want to get all that information in one smart spot? 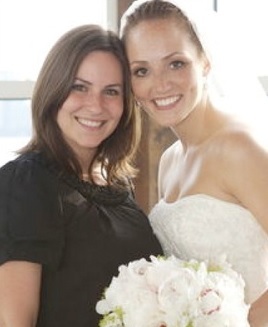 Visit one of my best friend’s Travel Blog: Jet Set Smart for incredible advice on traveling. Not only will she show you great obscure finds from all over the world, but she’ll give you ways to save more money the next time you travel. She’s been all over the world…so she’s not one of those bloggers who writes about Paris and how great it is, but has never set their eyes on the majestic beauty of the Eiffel Tower. She’s a smart traveler because she know about these places from experience and not just some hokey travel guide you find in your local airport. 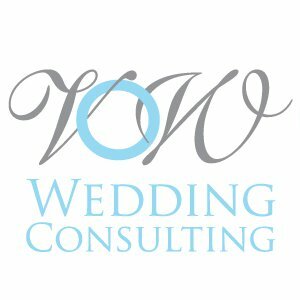 So go ahead and check her website out…whether it’s to plan your honeymoon, babymoon or just get away from it all. JetSetSmart your way to her site…I know you’ll love it!